Call Levels, a Singaporean fintech startup that provides real-time financial monitoring and alert services, has closed a US$500,000 pre-series A funding round led by 500 Startups with participation of veterans in the financial markets and tech industries, including Timothy Teo, an ex-GIC and JP Morgan banker, Gracelyn Ho, formerly of Morgan Stanley, and Koh Boon Hwee, a renowned businessman from Singapore. 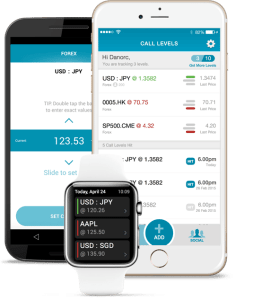 Incorporated in September 2014, Call Levels allows traders to track in real-time the price of stocks, commodities, forex and indices. The free-to-download Call Levels app, which is currently available for Apple iOS and Android devices, also provides with a notification service built and optimized for the mobile cloud. Call Levels intends to become a tool that is “comparable to professional systems but easier,” that “even New York’s biggest hedge fund manager would want to use,” Call Levels’ co-founder Cynthia Siantar, said in a previous interview with e27. In addition to its plans to aggressively expand beyond Singapore, the company said it will use the new capital to push user acquisition and hire additional talents for its team. Call Levels further said it has secured a major partnership with a financial institution in Singapore, which will be publicly announced next year. Siantar was previously a Hong Kong-based equity capital associate with HSBC and a Singapore investment analyst with Mercer Investment Consulting. Her co-founder, Chia, is the former vice president of Ortus Capital Management and an ex-investment manager at the Government of Singapore Investment Corp. In October, Call Levels was selected as a finalist in the upcoming Appster Awards, a competition that aims to reward those who are pioneering innovation within the multi-platform app industry. Call Levels, the only Asia-based company in the “Best Fintech App” category, competes against four other financial technology startups. Results will be released on November 18, 2015, during the App World London 2015 event at the ExCel in London. Cover image credit: Call Levels, LinkedIn.